Okay, full disclosure: This isn’t really ice cream. There’s no cream. There’s no eggs. That’s what makes it vegan. And it’s a little lighter and less creamy and heavy than ice cream. 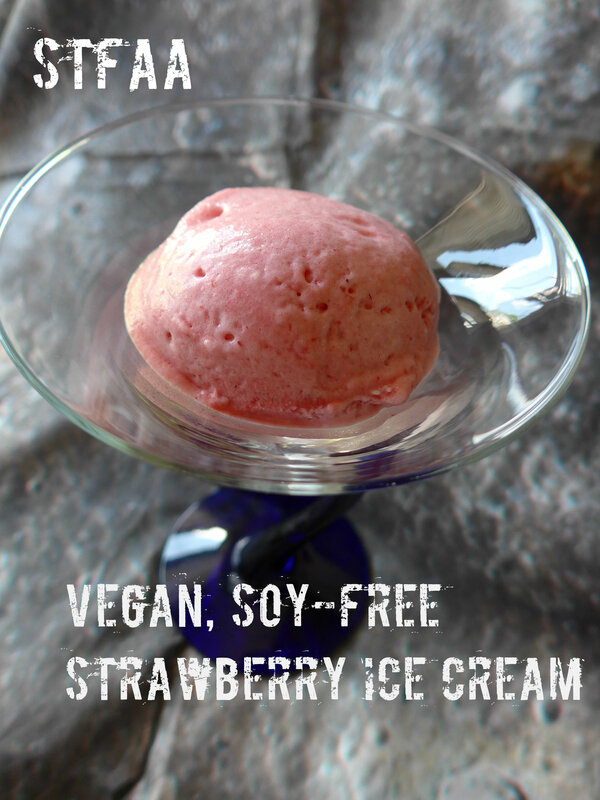 So I should really call it “strawberry frozen dessert.” But frankly, that’s awkward, and if you’re playing in the cooking realms of “vegan” and “allergy-friendly,” you’re used to substitutes, so you know what I mean. YOU DON’T NEED AN ICE CREAM MAKER! I have one. It’s great. But this is a quicker and easier and doesn’t require as much planning ahead. This is much easier with a stand mixer, but if you’re patient (or have someone who will spell you with the hand mixer), you can do this without one. I would not try it without any mixer at all, though. Electricity is your friend, here. The key “secret” ingredient in this dish is aquafaba or “bean juice.” It’s the stuff you drain out of the can of beans before using them, and I’ve raved about it before on the blog. If you cannot eat canned beans, or would just prefer to make your own, try this recipe posted by noted cookbook author Bryanna Clark Grogan on the Vegan Meringues FB page. You need half a cup here, but I’m sure you can find 100 other uses for it (I have). Aquafaba acts as an egg replacer, specifically egg whites, and can be whipped into an incredible meringue, which is what you start with here. You’ll make the whipped base and the flavor base, and then fold them together and freeze. That’s it! In order to get the fat content up and add a little tang and creaminess, I have used vegan cream cheese. I know this can be a problematic ingredient for those with multiple food allergies — I use Daiya brand, as I have no issues with it. I was perfectly happy with Tofutti when I could still eat soy, and I assume that would work here, too. The Daiya contains coconut oil, so it’s not entirely nut-free. I believe Tofutti is. Choose what works for you. If you make a homemade version of cream cheese that works for you, share it with us in the comments. Into a very clean bowl (any traces of fat will interfere with the whipping, I understand, just like with egg whites), add the aquafaba. Beat until you achieve stiff peaks. This can take up to 10 minutes, so be patient. Slowly add 2 Tablespoons of sugar, while you continue beating, and then the cream of tartar. If you’re using a stand mixer and have only one bowl, empty the foam into another bowl and reuse the mixer bowl. If you’re using a hand mixer, just get another bowl. Beat the cream cheese, strawberries, and vanilla until smooth. Fold the strawberry mixture into the aquafaba foam using a large spoon or spatula. Don’t stir. Fold. You will lose some of the air you’ve just whipped into the foam, but that’s okay. You just don’t want to lose all of it. When the mixture is fully incorporated, pour into a freezer-safe container and freeze at least 2 hours, maybe more depending on the size and shape of your container(s). This will never be as dense as “normal” ice cream, but it will take on a nice texture, distinct from the original unfrozen mousse.